Like the rest of the Cardinals’ rotation in May 1968, Bob Gibson nearly was untouchable. Unfortunately for Gibson and the Cardinals, he wasn’t unbeatable. 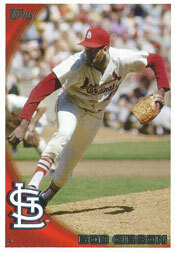 Led by Gibson, Cardinals starters had an ERA of 2.03 in May 1968. In six starts, Gibson’s ERA in May 1968 was 1.27, but his record that month was 2-4. Both of his wins required him to pitch extra-inning complete games. Gibson yielded only 10 runs (eight earned) in 56.2 innings in May 1968, but the Cardinals never scored more than three runs in any of his six starts that month. In Gibson’s four May losses, the Cardinals scored three runs total. May was the only month Gibson had a losing record in 1968. He was a combined 12-0 in June and July. Gibson finished the 1968 regular season with a 22-9 record, 1.12 ERA, 268 strikeouts, 28 complete games and 13 shutouts. He earned both the National League Most Valuable Player Award and Cy Young Award. With better run support, he could have been a 25-game winner that season.